What did you do before integrating the Wine and Management Programme? Before, I was a student in the United States but worked at a high-end boutique winery called Bloomer Creek in the Finger Lakes, New York. The most wonderful couple owned it and did everything - they literally built the building by hand, they did their own harvest on their own grapes, and made all of their wine using wild yeast fermentation (a very time consuming and complicated process). Everything by them was a labor of love, and I was so fortunate they let me into their small circle to manage their tasting room. They really taught me what the world of quality wine and passion was all about, and through them I started taking classes at the local New York Wine and Culinary Center until I found myself crashing into the world of sommeliers. What made you want to study in the wine field? I don’t think I can pinpoint one specific thing other than my general love for drinking quality wine in combination with insatiable curiosity. I learned very quickly that I preferred the wines which cost more than the ‘table brands’ that many students drank, but I didn’t know why. What made one wine better than another, and how are they made? Why is this one sweet and another dry, one buttery but one tart? I guess my curiosity took me down into this rabbit hole and by the time I realized this I was already months into managing a tasting room, had spent hours upon hours in sommelier courses, had spent time and money on books and lessons, and had acquired multiple pins from completing and passing exams, so I was too far into it to back out! It definitely helps that I love what I do - every day is new, and I live for adventure. I can’t imagine myself in any other field now. Can you tell us more about the beginning of your studies at Le Cordon Bleu Paris? In the beginning I was the best combination of excited, nervous, and terrified. I nearly failed my three years of French, so moving to a country where I struggled with the language was already daunting enough, but to be attending the school which was a household name for me as a child was just the cherry on top (or the “butter in the spinach” as I learned is said in French). My mother has a culinary degree, and the Cordon Bleu was already something I heard regularly about regarding its prestige and expectations. Nothing scares me more than not meeting expectations, and so I was (and still am!) always nervous I would fall short. But on the flip side, nothing makes me more excited than a challenge, so my entire experience here is solidifying my desire to overcome obstacles and prove to the school, the industry, my peers, but most importantly to myself that I can do it. 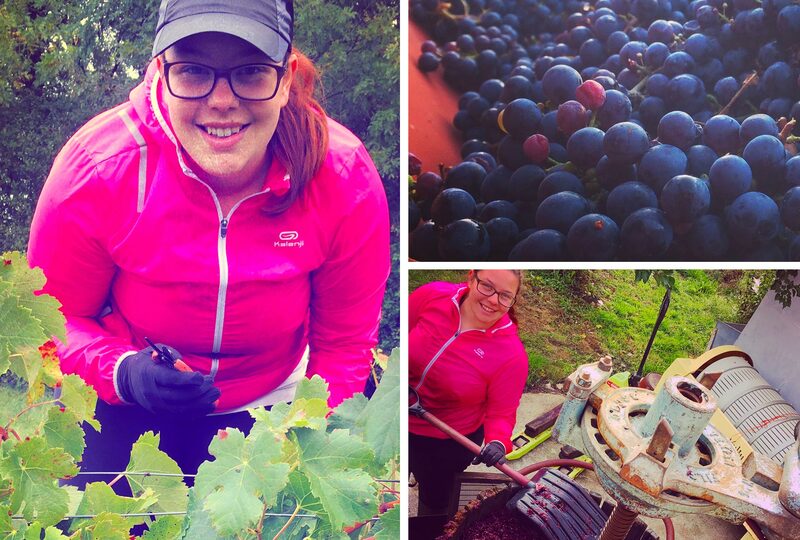 You had your first harvest internship at Saint-Emilion, how was that experience? In a word? Magical. The wine maker I was matched with, Paul at Cardinal Villemaurine, was so kind, and most importantly so informative. I know I have had the luxury of working other wineries before, but they have all been in the New World. It was personally important for me to have a good experience this trip because I was nervous that a poor one would have been my only experience and reference to French wine making, so I am thrilled I was lucky enough to work where I did. It was very hard work (only made harder by having a fever for the last week there!) but every day the work was more rewarding than the idea of feeling better. I don’t remember the last time I have been that passionate and happy with my own work. Would you recommend it to future Wine and Management students? Without a doubt! Because that is how I found out about this program. One upon a time, in what feels like ages ago, I took my certified sommelier exam in the USA. I was so nervous, and had only really had about a month to prepare for it. I also did three whole days of testing in a row, which is not recommended. So, I was burnt out, jittery, and all around not my best self when I noticed a young gentleman my age had finished the written portion of the exam at the same time I had. Since I was from the area, I offered to take him to the local liquor store to buy some sparkling wines to practice service with before our examination with the Master Sommeliers, and off we went. In my car, he mentioned he had worked in France after he graduated from Le Cordon Bleu’s wine program, and currently worked at Blue Hill at Stone Barns. I was so surprised that someone as young as him was working at a restaurant as famous as that, and was absolutely inspired unlike anything I had ever experienced before. Fast forward a few months, I knew I needed to continue my wine education and France was the place to do it. His words rang in my head, and it was a total of about 4 hours between thinking about something to do after college and sending in my application to only this school, because I knew it was where I needed to be. It has met and surpassed every expectation I had. What do you plan to do after your Diploma? My first stop will be Perth, Australia. It is my favorite place in the whole world, and the wine found in the Margaret River region is really remarkable. It is, however, hard to find elsewhere, so I would love to be able to help expand that market and let some of that amazing quality be recognized elsewhere through working either directly with a winery or through distribution or marketing. Someday, I will probably end up teaching as well to be able to give back to the field which gave so much to me, but I’m not sure where that will be.